While first described in 1542 by Portuguese Explorer Juan Cabrillo, for almost three centuries the Palos Verdes Peninsula remained undisturbed and the exclusive domain of the Gabrielino Indians, whose artifacts are still being unearthed. In 1827, Don Dolores Sepulveda received an original land grant to Rancho de los Palos Verdes, which translates to range of green trees. For over 35 years the 75,000 acres awarded by the Governor of Mexico California to Don Sepulveda supported several thousand heads of cattle and a flourishing hacienda. However, through misfortune and mishaps from 1862 to 1882, stewardship of much of this land passed from the Sepulveda family through various mortgage holders to Jotham Bixby of Rancho Los Cerritos. When land value dictated that his Peninsula property could no longer be used for only cattle grazing, Bixby leased the land to Japanese farmers for cultivating grains and vegetables. By 1913, a consortium of New York investors owned most of the Bixby land. Initially, these investors intended to divide the land into large estates. The founding father of the Peninsula, Frank Vanderlip, was one of these investors. Over the next decade, interest in the Peninsula would wane until Vanderlip allied himself with real estate promoter E. G. Lewis. The first homes began to appear in 1924. 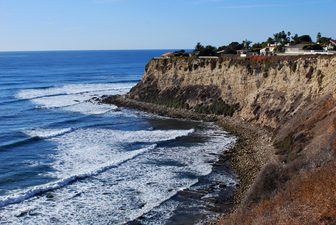 During the next fifty years the communities of Palos Verdes would begin to take shape. 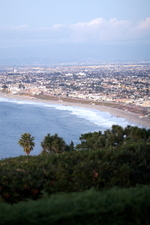 The Palos Verdes hills are primarily composed of rocks originally deposited as mud and sand under marine conditions. Earth movement subsequently caused folding, faulting and uplift. The coastline along the west and south sides of the Peninsula features striking topography - quiet coves and beaches protected by steep cliffs. The Palos Verdes Homes Association is responsible for interpreting and enforcing the architectural standards that apply to the City of Palos Verdes estates and Miraleste on the east side of the Peninsula. 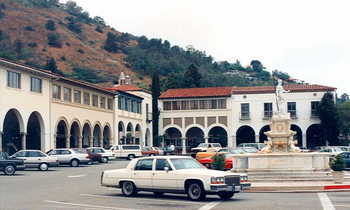 The quaint and elegant architecture and the Neptune Fountain from Italy of Malaga Cove Plaza has been used by many a producer for a scenic setting. Gentle westerly breezes keep the climate on the Peninsula moderate, with summer temperatures barely above 80 degrees and an average winter temperature of 67 degrees. Rainfall occurs only in the colder months. This wonderful Mediterranean climate offers Palos Verdes residents unparalleled outdoor activities which can be enjoyed throughout the seasons. Palos Verdes is the Spanish name for the Indian term "green trees". The Peninsula covers approximately 26 square miles. Within its boundaries are four cities: Palos Verdes Estates (1939), Rolling Hills (1957), Rolling Hills Estate (1957), and Rancho Palos Verdes (1973). There are also two unincorporated areas, Academy Hills and Westfield. Magnificent and inspiring sunset views can be enjoyed from many parts of the Peninsula. Sunsets in the winter months are especially awesome. The Peninsula boasts three golf courses, more than 60 miles of horse trails, eight developed parks that incorporate programs for groups, seniors and children. Other parks and undeveloped parks anywhere from 4.5 acres to 140 acres are scattered throughout the peninsula.